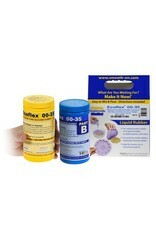 Ecoflex® 00-35 FAST is a soft, fast cure platinum-catalyzed silicone that is versatile and easy to use. Parts A and B are mixed 1:1 by weight or volume, pot life is about 2.5 minutes and rubber cures in about 5 minutes at room temperature with negligible shrinkage. Low viscosity ensures easy mixing and pouring. Rubber cures without "tacky" surface, is very soft, very strong and very "stretchy, stretching many times its original size. EcoFlex® 00-35 is off-white translucent and can be color pigmented using Silc Pig® silicone color pigments. Certified Skin Safe - Material is skin safe and certified by an independent laboratory to OECD TG 439. Liquid Ecoflex® 00-35 FAST will cure against the skin and can be used for life castingapplications to make rubber molds that cure quickly and are good for casting wax, resins, etc. Ecoflex® 00-35 FAST can also be used for a variety of skin safe applications including making fast skin safe appliances for special effects and cosplay, cushioning for orthopedic and orthotic devices worn on the body and much more.Ecoflex® 00-35 FAST can also be used to make fast cure rubber molds with high elongation for casting a variety of materials.